The quality of instruction is excellent and worth the small price. Lighting, sound and organization of instruction were all very good. The artist's character is great, really straightforward and his personal stories are interesting and relevant to the course. Thanks! This was a great basic guide. I was able to get simple tools and make my first maquettes from this after struggling in the past. It's already helped my with my character ideas and I'm sure it will with lighting and perspective issues in my paintings as well. So happy to have found this class. Awesome video. would love part two finishing! I've always struggled to draw my characters consistently in different scenarios and I've tried to do my own sculptures to help out, but I did that by trial and error. This video explains to you the basics on how to do the armour, tools, clays etc. I found it super useful. Can't wait for another video on how to refine the sculptures more. Great course! Looking forward to putting it into practice. 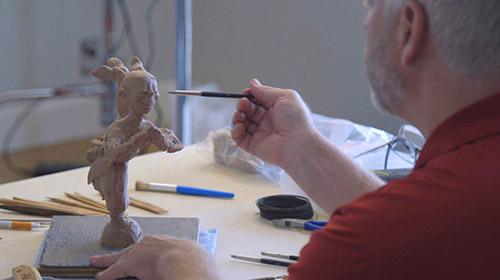 Dan Mortensen has worked throughout the animation industry creating maquettes, armatures, puppets, and movie sets. He also has an extensive gallery presence for his sculptures in western US galleries. This class is designed for illustrators who create sequential art for comics, children's books, or graphic novels. Achieving character consistency in your work is paramount to success in creating projects where characters repeat from page to page in different positions and perspectives. Dan gives you the basics to know what materials and tools you will need as well as simple techniques - to be able to sculpt your own characters to draw from. How much easier would it be for you to work from a 3d model of the character you designed? Follow along with Dan and learn how he quickly mocks up a character and then you will be better equipped to do the same with your creation.